I always like to give credit to the one who comes up with these fabulous techniques and I mentioned in my last post that I didn't know who that was, but did give credit to those I knew about. I'm happy to tell you that I've been told that the originator of this technique is Crystal French. The actual technique name is Reinker Spread. Connie Ingram (upline of Crystal's) demoed it at the Seattle Regional and the rest as they say is history. Anytime something this much fun and this beautiful arrives on the scene it is bound to spread like wildfire or in this case maybe we should say wildflowers (lol). Anyway, thanks Crystal for sharing! I can't wait to see what everyone else does - it's like walking through a flower garden - each flower is a little prettier than the last one. See you tomorrow - got to get busy making more flowers. The newest rage are these fabulous watercolor roses. They were originally done by, well actually I don't know, but I got the technique from Sandi MacIver, Patty Bennett, Kerin Sylvester and so many more! I've been looking at blog after blog and these flowers are so beautiful. Last night I finally sat down and made some roses. They're really easier than it looks, but you do need the Shimmery White Paper (pg. 156 - $6.95). This paper has a coating on it that allows you to work with water and have time to add your colors before it soaks in or balls up. The original instructions say to mist the paper, but I found that adding water with my aqua painter gave me plenty of water and worked best for me (actually I didn't have a mister). 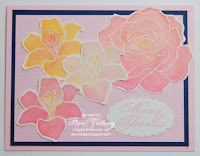 You stamp the flower using white craft ink and then emboss with white embossing powder, heat and you're ready to paint. Mist or wet the paper inside the embossing and with the tip of the aqua painter pick up a small amount of reinker and touch the water on the rose. It grabs the ink and spreads it out - it's fabulous to watch. I put a couple of drops of the colors I wanted to use in the tops of some extra Stampin' Store containers - you could also use a small paint tray. 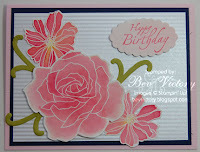 I went beyond the rose and tried the other two flower stamps in the Fifth Avenue Floral set. I actually love the look in all of them. I played with how much water, how much ink, how much blending and had a blast! It is so much fun - you will be seeing many cards with these and maybe even find it as May's main event at club! There had been a lot of conversation about how fast or slow they dried, but mine dried fast and I was able to cut them out within about 30 minutes. Note: you can use the heat gun to speed up the process. When I made my card I wanted a paper that would better match the roses for the Birthday sentiment - I dyed my own Shimmery White paper with Piourette Pink reinker and lots of water. I liked the look better with the roses. I included the work pictures so you could see how the water sits on top of the paper and this one with all the flowers I made last night. I think all of the flowers turned out pretty and oh this is so much fun! Now it's your turn - I promise you can't make just one! I need a birthday card for my husband and as I looked through my many stamp sets I ran across Card Games. This is a new set for me and so I put it together and made him King for a Day! 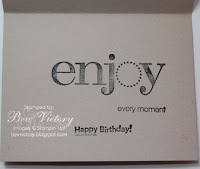 I used the Enjoy Every Moment set for the inside and of course a Happy Birthday stamp and I don't remember which set it came from - this is a sign of too many stamps! So here's the card - front and inside! I used Kraft, Black and Parisian Breeze DSP - the buttons are the fabulous corderouy brads in Kraft. This stamp set also has cards that say you make me laugh (joker) and Queen of Everything! If I was making myself a card it would be perfect, but that would also be pretty strange - so maybe I just need to loan it out - lol. Of course, one card is not enough - so the other card I made him was a tie! I cut out a pattern and made the tie from the fabulous Parisian Breeze specialty paper. It's cardstock rather than paper, but double sided and just wonderful. Bill has always loved ties and so I thought this was a perfect card. I'm sure others have made a pattern long before me, but this was my own idea and my own pattern. I used a clip from SU (now retired) and the greeting on the front was the Birthday Wish stamp from page 208 in the SU catalog. It's just $6.95 or free with any order of $40.00 or more from the mini occasion catalogue through tomorrow! This special ends 4/30 so if you want to order and get one of the sets on 208 free you must place your order on line or call me before midnight tomorrow 4/30! Inside I used the ballon from Crazy for Cupcakes and It's your day from the On Your Birthday set. I should have taken the photo before I wrote my note, but now you all know I love him! I made the paper to wrap his package (you will see it later) and got up with him at 3:30 a.m. to say Happy Birthday as he left for Canada for three days! Oh, and I had to make a custom envelope - might not have passed USPS inspection but for hand delivery it worked quite well. First thing he said was WOW you made the envelope! Enjoy the cards and rember you can order 24/7 online or call me anytime. Some fun new watercolor flowers will be added tomorrow. See you then. Last night was soooo much fun. We have such a great group for Christmas Card Challenge. We were missing two very important ladies last night, but the rest of us got our cards made and we had some beautiful designs. I should be taking group shots at the end of each week - perhaps at the end of the challenge we'll all bring one card back for a group photo. Ok, I'm off topic - surprise, surprise. My card for this month was a snow angel. For those of you who did not grow up where there was snow - you lay down in fresh fallen snow, move your arms up and down and when you stand there's the impression left in the snow that looks like an angel. Well, for me it's not the look, but the fun of making the angel. It was my favorite winter sport! When I saw this stamp set I had to have it. It retired way back, but it popped up on a blog I follow for sale and I emailed her quick! I was so excited and I couldn't wait to make a card with her. I cased the design from Baker 88 at Splitcoaststampers. I'm sure everyone was sick of hearing how much I loved making snow angels - the one thing I want to assure you is that I never had snowballs for sale! Takes a way from that angel thing - don't you think? Tonight I venture away from stamping for a brief look into my family album! Yesterday my favorite little Yorkie went to visit the groomer. When he got home he was so proud of the way he looked and I'm sure smelled, but that's another story. He took his favorite ball jumped up on the couch and posed for me for many pictures. But the one you get to see tonight is the one where he showed me his pearly whites! I ask him if they brushed his teeth and this was his response. Ok, maybe I just caught him with a shot at the end of a big yawn, but it sounds good and would make a great commercial for doggy toothpaste! He wouldn't like it if I didn't show you a normal picture too, so here is another picture with his attentive tilt of the head. Jack is soon to be five and he has filled our lives with so much joy - hope you all enjoy! I'll be back to stamping tomorrow. Keep on stamping and don't for get to embellilsh! What a beautiful day - after a weekend of dark skies and rain we are blessed with a day filled with sunshine and cool breezes. My post today is a card I've made for a friends birthday - hopefully she won't see this before she gets it (l0l) but if she does I think she'll still be surprised when it arrives in her mailbox. 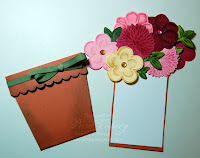 I'm on a roll with flowers and love my flower pot card, but last night looking at old pictures of cards past I saw one made with the small oval punch used as a vase and I thought what can I do to update that card. Well here it is! If you can punch and have a Big Shot you can make it in a breeze - so here are the basic in structions. 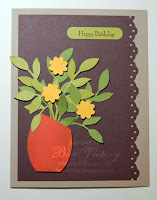 Pick out your card colors and then a color for your vase and flowers and you're ready to go. I used the wide oval punch for the vase and put just a little shading on the sides to give it some depth. Then I punched out four sets of "little leaves" - it's a sizzlits die, using my Big Shot. I used two different colors for the leaves. I place them behind the vase - oh yes, I used dimensionals to adhere the vase and I only put them in the middle leaving the sides loose and I used both snail adhesive and dimensionals to adhere the leaves. I left many of them flying in the breeze to give the 3D effect. 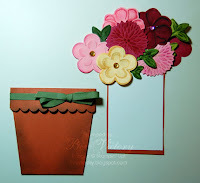 I punched out three flowers using the Boho Blossom punch. I chose Summer Sun for the bright color and chose not to add a center to keep them abstract and simple. 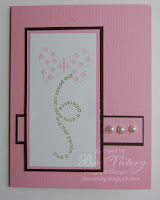 I used the word punch for the greeting and Happy Birthday is from the new Very Versatile stamp set currently available in the mini occasion catalog. I used the eyelet border punch down the side of the base paper and it's done! Now you can't deny that's easy, but gives quite an impact. If you have any questions about the materials I used or would like to place an order you can call me direct, email me or remember ordering on line is 24/7. Hope you enjoyed - now it's your turn. 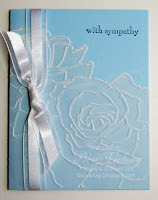 Sympathy cards are not something I like to make or send, but unfortunately this week I needed two. One friend lost a very long battle with breast cancer and a young man died suddenly leaving his wife and two young boys. It's times like this that make me stop and really think about what is important, to put in to perspective what is small stuff and what is really a major deal. My mom is a major deal, my husband is a major deal, my daughter and grand-daughter are major deals, my friends, old and new are major deals and my relationship with God is the most major deal of all! The rest of it is just small stuff. Now if I can keep this fresh in my mind as the days pass and the business of life once again takes hold. I pray I can - that I will look at all of the major deals listed above with fresh and loving eyes and not take them for granted nor ever let them slide down into the small stuff pile or let the small stuff become more important than the major deals! 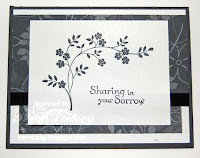 And now, this is one of the sympathy cards I made this week - I hope I don't need another one for a long time. Peace and God's love to all. Thank you so much for the accolades for my "flowers for mother" card. A number of you have requested instructions so I'm going to provide you with the link. I wish I could claim to be the brains behind the flower pot, but I only followed instructions. I made this card as a part of the splitcoaststampers Monday technique challenge. I changed up the flowers and I sponged the flowerpot to make it look like it had moss on it. I used my Big Shot and the embosslit dies; Cherry Blossom, Flower Burst and Simple Flower. The leaves are the embosslit Sweetest Stem. All of these are exclusive to Stampin' Up! I used markers and my blender pen as well as stamp pads and sponge daubers to color the flowers and the flower pot. I got my rhinestones for the flower centers from the fire rhinestone brads. They pop out real easily and then I glued them on with glue dots. I just arranged the flowers and leaves with dimensionals in a pattern that pleased me and then I called it done! I hope you will enjoy making yours as much as I did and thanks again for the praise. I must confess - first I'm a little late getting these cards up on the blog and second, Tuesday and Thursday's groups made a little different set of cards. Soooo, when you look at these pictures - you will know that those of you from Tuesday will see a card you didn't make and the group from Thursday will see a card they didn't make. Kind of makes you want to come to both, doesn't it! We were excited to add a new member to our afternoon group - Welcome Melissa! So with one out of town and one busy with Holy Week duties at church, we had 3 on Thursday afternoon. Tuesday (2nd Thursday came before 2nd Tuesday) evening we had 8 and had a grand time! Flight of the Butterfly is the stamp set used for this card. 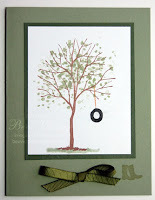 This next one is Branch Out - I wish I had taken pictures of the other cards - some used birdhouses instead of the tire - some stamped verses instead of the bow - all were so cute! I had many colors of the rainbow available in paper for this card and all of my inks out along with a variety of sentiments. Many of them used it as a Mother's Day card - all were beautiful. 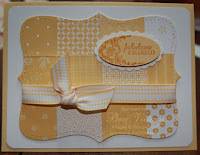 Can't believe what vellum turns into with the new embossing folder from Stampin' Up! You'll want to add one to your collection of dies. 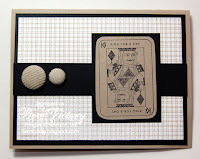 The Big Shot is becoming indispensible as you will see in the quilt cards coming up next! I had paper available for three different color quilt cards - these are the samples! This card is a breeze to make with the Big Shot and the Top Note Die. Also, don't you love the new scallop oval punch - it is so versatile. 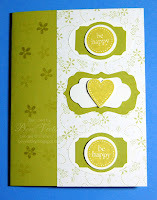 I wish I could take credit for these designs, but I cased cards I found on many different websites, blogs and the Stampin' Up! website. I am so thankful for the many talented women out there who share their ideas so freely. 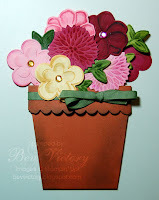 Last night I was checking out my stamping website connections and I found a "flower pot challenge"! What fun - they gave us a basic pattern for the flower pot and the rest was up to us. You open the card by pulling upward on the flowers. Now is this a cute idea or what. I love pull up cards, but I think this is now my favorite - You know me and my garden - and now a chance to give flowers that won't wilt! Now my dilemma do I give it to mom for her birthday 4/27 or wait until Mother's Day. I can't wait for her to see it so that probably will make the choice for me. I show her every card after I make it and this one is in hiding - lol. I didn't put a sentiment on the front or stamp the inside card until I make up my mind about which occasion. Both occasions are pretty important - she will celebrate her 99th birthday and 63 years of being my mom! She may not celebrate being my mom for all those years (lol), but I do! Enjoy the card and if you want instructions let me know - I will be happy to share. I've had so much fun today - stamping and chatting and making fun 3D items. I'm going to share the 3D with your now and will upload the other items in a later post. I've just got a few minutes before it's time to fix dinner - so here goes. I got an email today from Pennie, a fellow SUDSOL stamper with a tote she had made with her Big Shot and top note die and I loved it. I had to case it and I thought it just might work with the box#2 die - and it did!!!! Her blog is http://www.penniemccallum.typepad.com/ in case you don't have the #2 box die, as she gives a great pattern and her tote is really cute. Not at all like mine in the finished look. I made mine with card stock and Bella Rose designer series paper so the sides stand upright. I added a piece of Riding Hood Red taffeta ribbon with a rhinestone brad, stamped a sentiment from the new Oval All stamp set, punched it out with the large oval punch and layered it with piece punched with the new scallop oval punch. 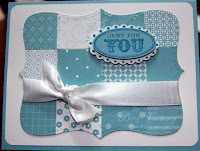 The new stamp set and new punch are both available in the Occasions Mini Catalog. I'm not for sure how I will use this - maybe filled with kisses, maybe some note cards - I'll just have to wait and see what comes to mind. I know it will make a cute gift for someone. The first club meeting was yesterday afternoon and we had a new member! We made three cards and looked at many more I had on display. I wish just once I could take full credit for the designs, but, of course, I CASED them all from the incredibly talented women at Splitcoaststampers, SUDSOL and Late Night Stampers. We have one more club date for this month on Tuesday night, so I'm holding off on the pictures of the cards until then. Check back next Wednesday and the pix will be here! I just wanted to thank Michelle Laycock (www.laycockdesigns.com) for designing my blog banner, buttons, background and signature (aren't they beautiful) and Heather Wright-Porto (www.blogsbyheather.com) for setting up my blog. I've been missing in action. I just finished the Avon Two Day Walk! I am third from the left in the picture. The six of us spoke at the opening ceremony and had just received our connection ribbons.. What an amzaing weekend. I planned on walking 13 miles on Saturday (we have a choice of 13 or 26) and 13 on Sunday, but I met such wonderful women on Saturdy, plus two of my friends from last years team came out and started with me, that I just kept walking at 13 and finally gave in at 18 and walked the two miles on home. Tthe course just happened to pass that close to my house this year. Yesterday I got up and completed the final 13 and celebrated at the finish with all of my new friends. Today I'm basking in the memories of all the ladies and men that walked anywhere from 13 to 39 miles and raised an amazing amount of money and awarednes for breast cancer research and assistance. I was fortunate to raise $3125 and am so thankful to all who donated to my walk. My walk this year was in memory of my very dear friend Emily Falkenburg who lost her battle last June and for eight friends who are currently in treatment or in remission! I missed stamping this weekend but I'm thankful that I was able to do this walk and for all those who supported me out on the course. Remember ladies, early detection is the best defense we have - check those boobies! I said the first person to quess how the "funnest cards eve" were made would win a prize! The winner is Konnie Johnson - she has already responded with almost the exact way to make the card - close enough to be the winner! The purse is made with 1/2 of the round tab punch and the handle is the small and large oval punches. Punch the small oval punch, then line up and punch the large oval punch - and cut in half. You can now see why I made two cards. 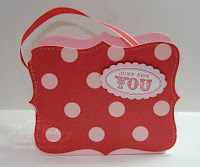 When you punch out your items you get enough purses, purse flap and handles for two cards . The other unmentioned punches were the BoHo flower punch for one of the decorations.and the the 3/4" square cut in 1/2 for tab on third purse - but as I said Konnie was close enough - the item I was really shooting for was the "round tab punch". We always need to be looking at every tool we have especially the punches and think how could I use that in an out of the box way! I'm thankful thatthose who do think out of the box share with the rest of us. Oh, yes, the prize - Konnie will get her choice of a SAB stamp set, paper or ribbon. Pays to check my blog. I will add these little contests along the way so keep your eyes open and congratulations Konnie! Ok, I don't think funnest is a real word, but it does describe the two cards I made the other night and you will see with this post. Just as I was preparing to go to bed I checked the Stampin' Up! demo site and found this adorable card in the Gallery. I changed the papers and the sentiment, but I would never have come up with the design in my lifetime! 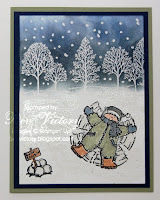 All credit goes to Nancy Alvarez a Stampin' Up Demo. I would love to know if my club members can tell me how they were made - if you can I'll give you a little prize. I love these cards and I hope you enjoy! A few days ago I uploaded a picture of a bunny card I had made. I thought it was the cutest bunny I could ever make, but then I found one on Splitcoaststampers and just had to make it too. I cased it from Gretchen Barron (http://gretchenbarron.typepad.com/) and her work is just amazing. She had made a chick and a bunny both using the SU top note die - I haven't tried the chick, but here's my attempt at the bunny. I made a few changes in the fllower and paper colors but I admit I copied more than I changed. the more I learn about stamping the more I know I have to learn. There are some amazingly talented women out there and I'm so thankful that they share. Enjoy!